Doggles - ILS Silver Skull Frame with Light Smoke Lens Customer Photos - Send us your photo! Gracie was found in horrible condition on the streets of OKC. She was saved by a Rescue, and had many medical problems including having to have her leg amputated. This is Gracie 8 months later wearing her goggles! My favorite Tri-Pod. Doggles are a great riding accessory! Taz has 70,000 miles on the back of my motorcycle and thanks to her Doggles her eyes have never been injured by a bug or other airborne debris. She looks super cool in the silver and flame design! He went blind due to diabetes and kept walking into shrubbery. Got him goggles to prevent further injury. So adorable! Happy go lucky, fun, loving Chihuahua from NJ sporting his skull doggles. Twix is a 3 year old beagle mix rescue. Recently, I went on vacation and left him under the care of an amazing babysitter who gave him a vacation of his own, as you can see here. He is staying cool in the hot summer sun. He wears Doggles to protect his eyes from harmful UV's so that he can see those rabbits and squirrels from a distance, always. Twix is a 3 year old beagle mix rescue. He's a tireless, fun loving, running, and jumping pup. I've yet to see him turn down a walk outside. He accompanies me 3-5 times/week to run 5-15 miles, as well as anywhere else I can take him. He wears Doggles to protect his eyes from harmful UV's so that he can see those rabbits and squirrels from a distance. Teddy is my Lhasa Apso Service Dog, so he needs to go every where with me. He loves when we go out on our motorcycle. He wears his Doggles to protect his eyes. We love doggles. Timmy's ophtalmologist recommended them and it's the first thing we pack when we go to the beach! Niko & Jack at the Outdoor Market. Sgt Pepper loves riding in the car, and loves it even more when his Dogglesare on to help protect his eyes! Marley is ready to watch the fireworks with his new doggles! Trying on her new eye wear before getting on the motorcycle. Duncan likes to ride in the sand dunes and play on the beach. He got these doggles for his birthday to keep the sand out of his eyes. Thank you so much for my recent order i just wanted to share with you how Sally rides now!! This product is very comfortable for her to wear and she does not mind the fit at all! He was adopted at the Humane Society when he was 3yrs about 5 yrs now. Loves to watch TV! Loves to try and bite the thunder. Loves his skull and cross bone sunglasses. He wore them to the beach. Cool! Gunner & his little side kick Zoomie. These two are thick as thieves. Looking covert in their shades. Beckham likes to be stylish at all times, including preparing for car rides! Czer will be going on moped rides with me. Slider loves to cruise around and pick up the ladies. They all think his Doggles are super fly! SKIP ABSOLUTELY LOVES GOING ON THE BOAT AND SWIMMING ALL DAY. HE ALSO ENJOYS PLAYING BALL AND FRISBEE. HERE HE IS ENJOYING ANOTHER DAY OUT. We accompany Impress on her motorcycle rides. She loves the open road! Pretty studly in my new Doggles! We got Wilson at the Humane Society as a companion for my other dog. He loves to watch TV. He is the sweetest dog. He is in BaxterBoo sunglasses. My little Pumpkin, he loves getting new clothes everyday, I hope I win, so I can support his habit. He's very smart, sweet, and lovable and the cutest puppy ever, he is 8 months old now. And he wait till my next order. As for me I'm going broke buying him all the clothes he wants, LOL! Qwi loves to have her photo taken wearing the goggles. SKIP RELAXING AFTER A LONG DAY ON THE WATER. Otto loves his new shades for riding in his bike basket! Rocco loves to bike with us. He recently lost an eye and we bought him doggles to protect his other eye. Still enjoys the ride looking super cool. Fianna, my Schnauhuahua wearing her Bad to the Bone Doggles with the Skull and Crossbones motif. Not only do these look amazing on her~We also live on a farm and they protect her eyes AND she loves them! Charlie loves Baxter Boo and his Doggles! Marmaduke rockin' his new doggles!!! Take a Nap or ready to ride with Mom! Ice is a little gal with lots of attitude...this was the perfect prop for her! My little side-kick that rides in back & helps me fight MS all the way! Moe waiting patiently for us to go on a ride. He loves to ride so much. Moe loves riding with us on our bike. He loves having his face in the wind and the doggles help keep him safe. Jordy feels really cool in his new Doggles with his Michigan Bandana. And he loves his new GoDog Stretch Moose. Lucy loves to float on the pool with her Daddy! Hard to believe but here's a black lab who does NOT like the water. She'll float in the pool as long as she has a raft but no swimming! Are We Going For A RIDE DAD!! Fred waiting to go for a walk wearing his doggles. Bugs loves his new goggles!!!!!!! Irma ready to show off on her skateboard with her new doggles and biker vest! Cocoa is just too cool for herself wearing her Doggles sunglasses! Out for a ride on the ATV. sprocket is anxious for spring Harley riding in her cool new goggles. She loves them!! Smokey rides to bike shop to buy a new derailleur to keep his ride smokin smooth! Just waiting for the snow to melt to go riding with my mom on her motorcycle! In a convertible car or on Harley motorcycle..GypSea loves to get 'in-the-wind'. Howdy sitting in his motorcycle seat with his doggles. This is Andy with his new Doggles. He was having to wear a collar to protect his ulcerated eye. Now has more freedom and is able to eat and drink. Abbie sporting her new Doggles! Dude oh so cool in my new doggles from baxter-boo.. When not watching his Red Sox play, Fenway is always ready for a ride! Sophie loves to ride in style!! I wear 'em 'cause I'm cool like dad, cool like dad, cool like dad, cool like dad! Yeah! Lu Dog enjoying Memorial Weekend with the family. Maggie getting ready for vacation! Kula Love's his skull Doggles, now he's the coolest dog at the Bark Park! Mickey is diabetic,and as a result, blind. He often runs into brush or other objects, endangering his eyes, which do not know enough to close. The Doggles (which arrived in THREE DAYS!) will save him a lot of pain, once we get him to leave them on for his walks. 3 year old Maltese....loves his doggles!!! ...here's Tui, stylin' in the Arizona sun, with her new Doggles!! Bubba showing off his sunglasses. I didn't think my little guy could look any cuter until I put on his new Doggles! Now he's adorable!! Thank you for the rapid delivery and great service! Here's Truk on a 2 day rafting trip on the Upper CO River. At the last minute I realized she would need doggles, as she has sun sensative eyes. I placed my order on Wed and got them on Thurs, just in time! Thank you Baxter Boo! Hi, I am Drifter. I am moon's brother, but definitely the cute one.... So pick me!! Posted On 05/03/18 by Marcia C from , KS Yes, Marcia C recommends this product! We use these for our Yorkie who loves to stick her head out the truck window! We need to protect her eyes. She doesn’t seem to mind wearing them at all. Posted On 04/04/18 by Marcia C from Great Bend, KS Yes, Marcia C recommends this product! These are awesome goggles. We put them on Gracie, and she didnt mind them a bit. Took her walk in them with no problem. We can't wait to try these out while riding in the Truck. She loves to stick her head out the window, and these will protect her eyes! Look great, fit great, and they protect his eyes from debris! Posted On 08/29/17 by Kimberly C from cambridge, NY Yes, Kimberly C recommends this product! Posted On 06/19/17 by Patti O from Denver, CO Yes, Patti O recommends this product! Great fit, love these. He's definitely the coolest doggie on a motorcycle. Posted On 11/17/16 by Mari R from WOODBRIDGE, NJ Yes, Mari R recommends this product! Great product, comfortable and safe. My Chihuahua didn't even try to take them off. Received a lot of compliments on how they looked. He looked so handsome. Posted On 05/05/16 by Beverly F from Keithville, LA Yes, Beverly F recommends this product! Shipping was so fast. The tinted goggles fit perfectly. They are well made and just too cute. Good find. Posted On 09/20/15 by RoxAnn N from Defiance, OH Yes, RoxAnn N recommends this product! Loved my first pair so much that I had to order a second pair for my Yorkie! he gets a lot of attention and compliments! Posted On 04/07/15 by Despina P from Glen Oaks, NY Yes, Despina P recommends this product! Great Doggles.... all of Chole's friend have a pair. Love this.. Chloe wears them... and I got 2 extra pairs for her friends. Posted On 03/13/15 by Despina P from Glen Oaks, NY Yes, Despina P recommends this product! These Dogles are Great... My Chloe wears them in the car. Posted On 02/04/15 by Paige from Savannah, GA Yes, Paige recommends this product! 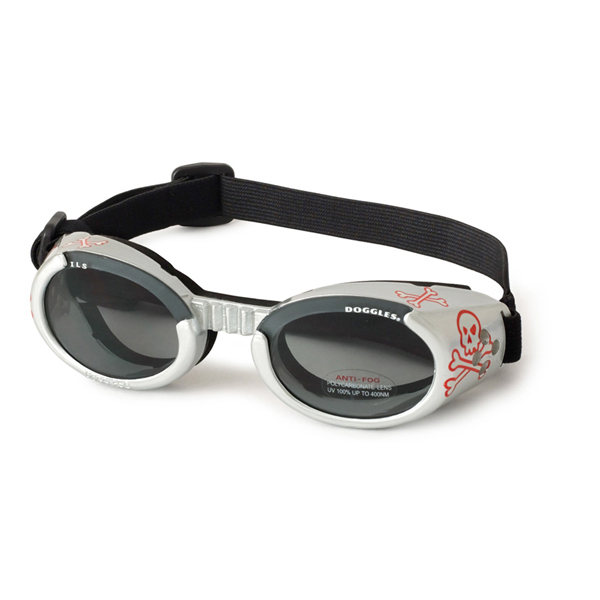 These fit perfectly, no problems, I look cool and stylin' in my racey silver skull and crossbones goggles. They're not very dark, which is one thing I was afraid of. Optically clear. Great for serious riders as it protects from wind and sun on the bike, as well as scuffles with others. My Bostie big protruding eyes do not offer much protection, and I've already been there done that with the corneal tear opthalmology surgery, so I'm protected to the nines now. No fear! My dog looks like a VERY COOL BIKER DOG!,!!! Posted On 12/25/14 by Kim S from Clearwater, FL Yes, Kim S recommends this product! OMG !!!! LOVE them! I'm looking to purchase a trike for us to ride. 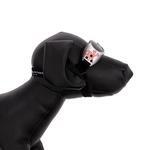 I'm unable to hold up a bike so we need a trike to go with Max's Biker jacket that's perfect that we bought and these Amazing goggles that I think every dog should wear that hangs its head out the car window or like me, intends to ride with him on our trike! They fit snugly which you control simply by pulling a strap ! No air is going to hurt my babies eyes. Posted On 12/16/14 by Howard G from , AZ Yes, Howard G recommends this product! Our Schnauzer recently went blind. He has had diabetes for 6 months now and gets insulin twice per day. The cataracts came on in a matter of a couple of days and he fell completely blind within 3 days. We bought these Doggles to protect his eyes as he still loves his walks in the woods and is often around bushes and sticks. These have definitely helped to protect my little buddy's eyes and he doesn't mind wearing them. These are for my kitten! Now my chihuahua and kitten have matching sun glasses! Can't wait for them to wear them! Posted On 10/31/14 by Tracee S from , Yes, Tracee S recommends this product! I got these for my Maltese pup, he gets lots of compliments at the park. The really keep the dirt out of his eyes. I bought him another pair to wear, k9 optix, but these wrap around his eyes better as he has allergy problems. These are nice, lightweight! Posted On 10/26/14 by Carla S from Fort Worth, TX Yes, Carla S recommends this product! Great quality product. The XS size is a perfect fit for our Yorkie. Very smooth transaction with Baxterboo. Highly recommend for future purchases. Posted On 10/24/14 by Rebecca G from , MN Yes, Rebecca G recommends this product! They r great, my dog needs to get use to them. But they work great for him on the motorcycle. Posted On 10/18/14 by Dianna P from , Yes, Dianna P recommends this product! Me and my lil man love hanging out in the outdoors but no one likes having sun in their eyes. These are awesome looking, I wasn't sure how they were going to fit being that he's small (7 pounds) but he looks great in them! Posted On 02/05/14 by Samantha G from Vernon , NJ Yes, Samantha G recommends this product! We bought these for are dogs because they ride on the motorcycles with us to protect there eyes. Not only are they styles has our girls are divas, the fit for both are perfect and with the bottom strap it helps secure a perfect fit and keeps them on. It took them a bit to get use to but once they did they know when the doggies come out , it is time to ride. This Doggles product fits my small Chihuahua perfectly & stays on properly. It's super cute-even for a girl-and well made & durable. Posted On 11/08/13 by amber h from Astoria , NY Yes, amber h recommends this product! These googles are so cute people just want to take pictures of her wearing them. You just have to start them off slowly with wearing them, since she would shake her head a knock them off. I really like this site. The selection is great and the shipping time is awesome. Some sites (which shall remain unnamed) have s-l-o-w shipping and is a little frustrating. When I order from BaxterBoo it seems like it's here the next day and I love that!!! The quality of their products is up there so you don't have to worry if it's cheaply made, because it isn't - at least I haven't gotten anything that falls into that category yet and don't expect I will.The only drawback is that occasionally there will be a product that doesn't have the body length in the dimensions, so I tend to stay away from that, but I'm sure if the manufacturer provided that it would be on the product information.